A JEHOVAH’S WITNESS has been sentenced to six years in prison in Russia for religious extremism following a campaign targeted at the community in recent years. 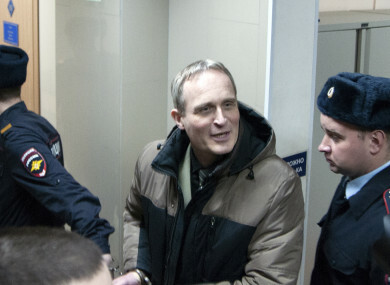 Danish native Dennis Christensen was arrested in 2017 by Federal Security agents at a meeting of Jehovah’s Witnesses in Oryol, south of Moscow. This was Russia’s first arrest of a Jehovah’s Witness for religious extremism. According to a statement by a Russian wing of the Jehovah’s Witnesses, Christensen’s lawyers will be appealing the decision. Meanwhile, he will remain in a detention facility in the Oryol region, where he has already spent 622 days. The group, along with members of the international community, have called for his release, saying the arrest is unconstitutional. Human Rights Watch (HRW) called the verdict “a disgrace”. Andrea Kalan, of the US Embassy in Moscow, said on Twitter that she is “deeply concerned” by the sentence. The same group said Russian authorities have carried out dozens of home raids, searches and interrogations in recent years. Since 2007, many items of Jehovah’s Witness literature have been banned as being “extremist materials”. In 2010, the European Court of Human Rights found the dissolution of the Moscow branch, and the refusal to allow the group to re-register, constituted a number of violations of the Convention. In 2017, Russia’s Supreme Court banned the organisation outright. “The Jehovah’s Witness faith is not an extremist organization, and authorities should stop this religious persecution of its worshipers now,” said Rachel Denber, deputy Europe and Central Asia director at Human Rights Watch. Email “Jehovah's Witness sentenced to 6 years in Russian prison for 'religious extremism' ”. Feedback on “Jehovah's Witness sentenced to 6 years in Russian prison for 'religious extremism' ”.